Warning: This is a long read, but it covers a great deal of important and useful information about rehabilitation following total shoulder replacement surgery. Given the growing elderly population, total joint replacement surgeries have become more common. It seems that those of us who work in outpatient clinics seem to be seeing more and more patients following total joint replacement. This was especially true for me when I worked at the local VA Medical Center. The most common joint replacement we saw in our specialty clinic was the total shoulder replacement. Whether it is a standard (or anatomical) shoulder replacement, or a reverse total shoulder replacement, I noticed many clinicians feel intimidated when treating a patient who has recently undergone total shoulder replacement surgery. Hopefully this article will help demystify rehab of the total shoulder replacement and will increase your confidence when treating them in your clinic. Each component plays an important role in stabilizing and moving our arms (upper extremities). They rely on balanced contraction between varying muscles to produce the wide range of movement that the shoulder is capable of completing. To read more about the balance of shoulder muscles and the most common muscular imbalances that occur, check out our article on the Core-4 Shoulder Program Here. Let’s take a look at each of these components and the role they play in shoulder function and movement. The SC joint acts as the only bony attachment that the upper extremity (UE) has to the axial skeleton. 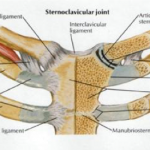 As a result, the SC joint tends to remain very stable, held to the sternum by strong ligaments. Even though it is a stable joint with strong ligaments, it still provides for some movement during shoulder range of motion. The SC joint allows for elevation, depression, and retraction of the clavicle during normal shoulder movements. It also allows some axial rotation during shoulder elevation . 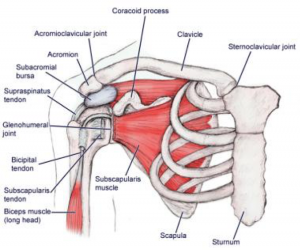 Moving up the chain, away from midline, lies the acromioclavicular (AC) joint. 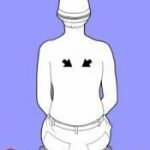 This joint connects the distal portion of the clavicle with the acromion process of the scapula or shoulder blade. As a result, it is responsible for transmitting the force from the clavicle to the acromion. This joint is involved when someone “separates” their shoulder. An injury to the acromioclavicular and coracoclavicular ligaments can cause the clavicle to “separate” or sit higher to the acromion process. The AC joint allows for much of the same movement that the SC joint does, as they are both attached to the clavicle. The AC joint provides for elevation and depression of the clavicle as well as axial rotation during shoulder elevation . The scapulothoracic joint, or gliding mechanism is one of the more complex structures in the shoulder complex. A total of 17 muscles attach to or originate from the scapula, making it an integral player in stabilization of the upper extremity. Some clinicians or academics will call it the “scapulothoracic joint”, but yet others call it a “gliding mechanism” because it has no bony attachment to the axial skeleton other than through the AC and SC joints . 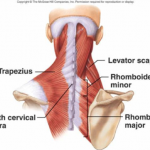 The scapula is held in place through a few key muscles: the trapezius muscle, the rhomboids (major and minor), and the elevator scapula. 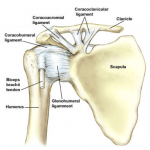 When people talk about the “shoulder joint”, odds are they are referring to the glenohumeral (GH) joint. This joint attaches the humerus, or arm bone to its “socket” in the glenoid fossa of the scapula. It is a synovial ball and socket joint, meaning that a fluid-filled joint capsule encloses the ball (head of the humerus) and socket (glenoid fossa of the scapula). The GH joint is unique in that it is comprised of a large ball and a relatively small and shallow socket. Only about 25-30% of the humeral head contacts the glenoid fossa during normal shoulder movement and positioning . 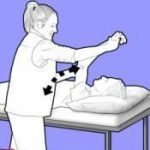 This makes the joint more mobile because the humerus is more free to move around and not become restricted by a deep socket. This also leaves the GH at risk for instability, subluxation, and dislocation. As a result, the GH joint relies on dynamic (moving) and static (non-moving) stabilizers to ensure it stays in its socket throughout shoulder movement. The static stabilizers include the large, thick capsule ligaments that surround the GH joint. Though they allow for the humerus to move in various degrees and motions, they hold it tightly in it’s place in the glenoid fossa. The dynamic —or moving— stabilizers of the GH include the rotator cuff muscles as well as a few additional muscles in the arm . 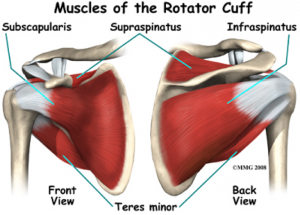 Four muscles make up the rotator cuff: the supraspinatus, the infraspinatus, the subscapularis, and the teres minor muscles. These muscles act as the primary movers of the GH joint, as well as the stabilizing force that keeps the humeral head centered in the glenoid fossa. The tendons of each rotator cuff muscle blends intricately with the fibrous joint capsule . Contraction of the rotator cuff muscles during shoulder movement causes a concavity-compression, which centers the humeral head in the glenoid. This is one of the most important stabilizing mechanisms of the shoulder . Along with the rotator cuff muscles, the deltoid and biceps muscles also provide stabilization to the GH joint. The deltoid muscle, which sits on top of the shoulder, also assists with GH flexion, extension, and abduction. The long head of the biceps actually inserts into and blends with the labrum of the shoulder —the cartilage ring that goes around the glenoid fossa . The long head of the biceps acts as a humeral head depressor during abduction, centering it over the glenoid fossa during this movement. Again, books and courses have been written and developed on the subject of the shoulder complex, but this basic anatomy review will serve to lay the foundation to understanding total shoulder replacements, the recovery, and the rehab process following them. 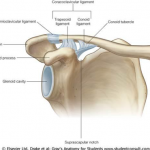 Understanding the anatomy of the shoulder complex, we can now take a look at the reasons why someone may undergo shoulder replacement surgery. The main indications for total shoulder replacement involve advanced pathology of the glenohumeral (GH) joint. This advanced pathology typically stems from osteoarthritis (OA), rheumatoid arthritis (RA), osteonecrosis, fractures involving the head of the humerus, and rotator cuff tear arthropathy . Typically, a total shoulder replacement is a viable treatment option when the bony structures of the GH joint have experienced considerable degeneration, causing severe and constant pain. 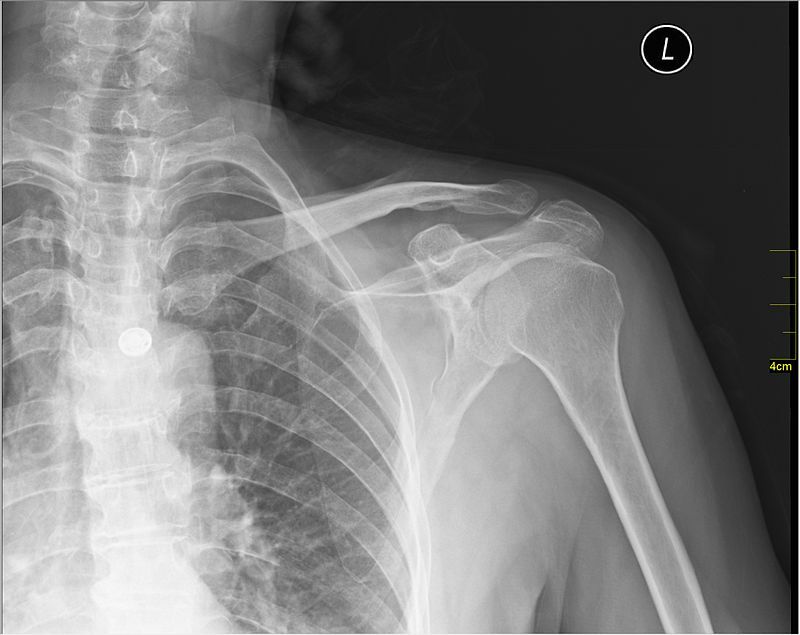 It is also a treatment option for complex fractures in the shoulder area. This type of total shoulder replacement is known as a standard (or “anatomical”) total shoulder arthroplasty (TSA). It receives its name from the simple fact that the prosthetic components that are placed in the shoulder look like the structures they are replacing. Basically, the shoulder joint will look the same following a standard TSA. 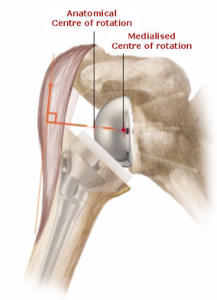 The humeral head will still look like a ball, and the glenoid will still look like a cup or socket. Another type of shoulder replacement surgery, that has been gaining popularity in recent years, is the reverse total shoulder arthroplasty (rTSA). It receives its name from the fact that the prosthetic components placed in the shoulder are oriented in the opposite direction. The humeral head becomes a cup or socket, and the glenoid becomes a ball. 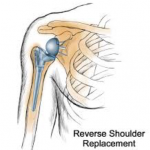 Reverse total shoulder replacements are typically used when a patient may be a candidate for shoulder replacement, but their rotator cuff is either non-functional or not repairable (if it is torn). The rTSA was first developed in Europe in the 1980s, but wasn’t approved by the FDA for use in the United States until 2004. Since its approval, it has become more popular when treating GH arthritis when it is associated with irreparable rotator cuff damage, complex fractures, or revisions of standard TSAs that have developed a deficient rotator cuff . Additional indications for rTSA include, proximal humeral fracture with malunion/nonunion, post traumatic arthritis, a deficient Rotator Cuff, severe humeral head collapse following massive RC tear, revision of previously failed conventional TSA, and Rotator Cuff Tear Arthropathy . When a patient suffers from Rotator Cuff Tear Arthropathy, their GH joint exhibits 3 distinct feathers: 1) rotator cuff insufficiency, 2) superior migration of the humeral head, and 3) degenerative changes of the GH joint . This causes the humerus to ride high, impacting the glenoid and acromion, resulting in what is referred to as “end-stage GH arthritis” . As we will see down below, there are some considerable differences when rehabbing a rTSA vs a TSA, because the rTSA changes the biomechanics of the shoulder significantly. Side Note: Throughout the rehabilitation process, we want to ensure that we are facilitating appropriate motor patterns. Especially following surgery or in a time of pain, the body attempts to guard the affected area and compensate with other muscles to limit pain. This must be avoided and guarded against because it will lead to bigger problems down the line. This is especially true of the scapulothoracic muscles. 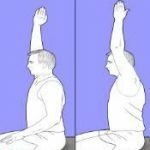 Remember from the video near the top that the shoulder blade and its position greatly affects the overall positioning of the shoulder and arm. Most people suffering from any kind of shoulder pain develop inappropriate compensatory motor patterns in their shoulder blade muscles that can increase pain, decrease range of motion, and impair functional abilities . In order to prevent this type of complication, the therapist should make sure that their client is using the right muscles at the right time during range of motion. Ensuring appropriate posture and form during therapy and range of motion exercises can prevent unwanted troubles or pains resulting from inappropriate motor patterns. You can download a handout with a short summary of this article and a copy of the protocol here. Again, different hospitals, clinics, and surgeons may have variations in the timelines and may even delay or advance different exercises and activities, but this is a good, basic, and evidence-based protocol to guide treatment if you are in need. It’s always a good idea to keep an open line of communication with the surgeon or their office to make sure that everyone is on the same page when it comes to the rehab protocol after any surgery. Important: In addition to these precautions, with rTSA there is an additional precaution. The combination of shoulder extension and internal rotation must be avoided! Putting the arm in this position following a rTSA can cause the shoulder/prosthetic components to dislocate. The picture to the right illustrates the position to be avoided. 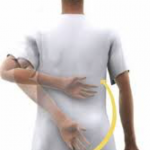 Instruct patients or clients that have undergone rTSA to avoid any functional activities such as tucking in their shirt tail or reaching behind for their wallet with the affected arm to avoid the potential of dislocating the new joint. This precaution must be followed for at least 12 weeks post-operatively, though some physicians will extend this precaution for the life of the joint. As stated earlier, clinicians should pay attention throughout the rehabilitation process to make sure that their patient or client is demonstrating appropriate motor patterns throughout movement. Specifically with reverse total shoulder replacements (rTSA), clinicians must understand how the surgery has changed the biomechanics of the shoulder joint. 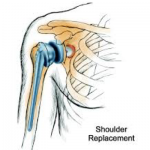 These changes greatly impact the overall function of the shoulder. Let’s talk about how a rTSA changes the actual biomechanics of a shoulder. The design of the rTSA prosthetic components moves the center of rotation of the GH joint down (inferiorly) and closer to the center of the body (medially). This helps the deltoid muscle become the primary mover of the shoulder. Since the rotator cuff is non-repairable or non-functional, the deltoid takes the place of stabilizer and mover of the shoulder. Moving the center of rotation down and in increases the torque that deltoid can produce as well as improves the line of pull of the deltoid. When treating patients or clients who have undergone rTSA, deltoid function must be a major focus of therapy, both in the early and late phases. Focus on initiating sub-maximal deltoid isometrics in the early phases of rehabilitation and progress to enhancing deltoid strength and function during the strengthening phases. Time must be spent in therapy to teach patients or clients in learning recruiting strategies to make the deltoid be the primary shoulder mover . You may want to consider using kinesiology tape to facilitate deltoid muscle recruitment during range of motion. You can read our series on kinesiology tape here for more info on that. It is also important to look at the muscles of the scapula, as they will also be providing stability to the shoulder. Just like standard TSA, we want to make sure that our clients or patients are not compensating with inappropriate motor patterns. The scapular muscles, especially the upper trapezius and levator, are commonly used to compensate during shoulder elevation. This should be avoided and addressed early in therapy to avoid complications later down the line. It is important to remember that these are general expectations. Some patients may achieve greater range of motion and some may struggle to reach the “norms”. At the end of the day, treating patients or clients that have undergone total shoulder replacement can be challenging, complex, and will require you as the clinician to be on top of your game. Understanding the basic anatomy of the shoulder complex gives clinicians a frame of reference for what typical and appropriate motor patterns and joint position looks like. Special care should be made throughout postoperative therapy to ensure that appropriate motor patterns, especially in the scapular muscles, are being used when completing range of motion. Clinicians must understand the difference between TSA and rTSA and the different precautions and considerations that apply to each, specifically with rTSA as the biomechanics of the joint are greatly altered by the surgery. Keep an open line of communication with the referring physician to ensure that all department or clinic-specific precautions or protocols are in place and that the patient or client is progressing safely through the rehab process. If you’d like to grab a free handout covering TSA & rTSA that includes the 4-phase rehabilitation protocol included in this article, click here. You can also check out our resources page to see all of our exercise programs (like the Core-4 Shoulder Program), educational, and clinical resources. Do you work in a clinic that treats total shoulder replacements? Do you have any resource recommendations for other clinicians in this space? Tell us in the comments below! 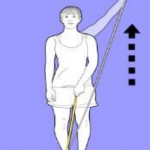 Thanks to physiotherapyexercises.com for use of exercise illustrations.